We derived a mouse model in which a mutant form of Nbs1 (Nbs1mid8) exhibits severely impaired binding to the Mre11-Rad50 core of the Mre11 complex. The Nbs1mid8 allele was expressed exclusively in hematopoietic lineages (in Nbs1-/mid8vav mice). Unlike Nbs1flox/floxvav mice, which are Nbs1 deficient in the bone marrow, Nbs1-/mid8vav mice were viable. 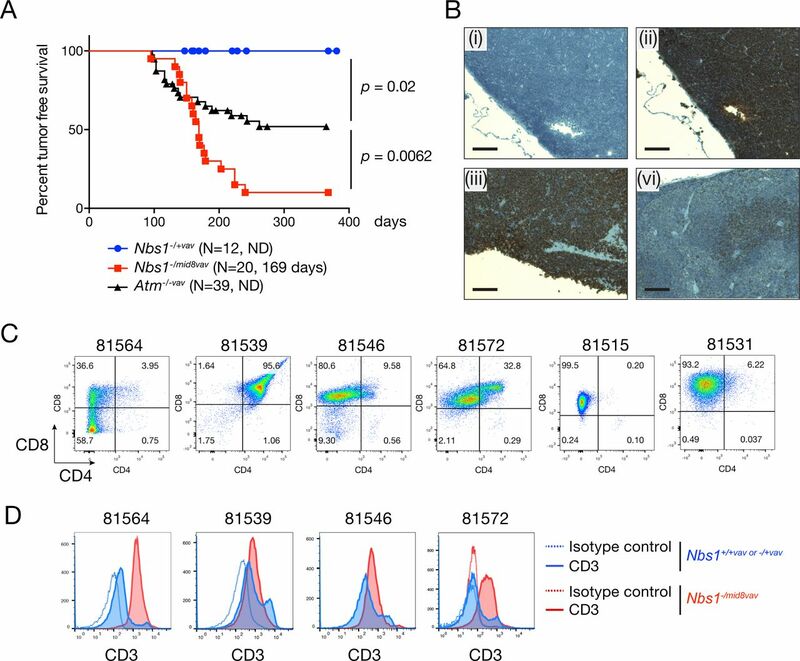 Nbs1-/mid8vav hematopoiesis was profoundly defective, exhibiting reduced cellularity of thymus and bone marrow, and stage specific blockage of B cell development. Within six months, Nbs1-/mid8 mice developed highly penetrant T cell leukemias. Nbs1-/mid8vav leukemias recapitulated mutational features of human T-ALL, containing mutations in Notch1, Trp53, Bcl6, Bcor, and Ikzf1, suggesting that Nbs1mid8 mice may provide a venue to examine the relationship between the Mre11 complex and oncogene activation in the hematopoietic compartment. Genomic analysis of Nbs1-/mid8vav malignancies showed focal amplification of 9qA2, causing overexpression of MRE11 and CHK1. We propose that overexpression compensates for the meta-stable Mre11-Nbs1mid8 interaction, and that selection pressure for overexpression reflects the essential role of Nbs1 in promoting assembly and activity of the Mre11 complex. The DNA damage response (DDR) is a network of pathways that mediate DNA repair and DNA damage signaling. The collective functions of the DDR preserve genomic integrity and viability in the face of myriad intrinsic and extrinsic genotoxic stressors. In addition, the DDR is a barrier to tumorigenesis (Ciccia and Elledge, 2010). The Mre11 complex, composed of Mre11, Rad50, and Nbs1 is a sensor of DNA double-strand breaks (DSBs) and is required for the activation of the ATM axis of the DDR which parallels the ATR-Chk1 axis. The complex also plays an integral role in all aspects of DSB repair (Syed and Tainer, 2018). Additionally, the Mre11 complex controls a non-canonical DNA damage response implicated in suppressing oncogene-driven carcinogenesis. Expression of the neuT oncogene in mouse mammary epithelium elicits the formation of DDR markers such as 53BP1 and γH2AX foci, as well as marked heterochromatic changes. In the context of Mre11 complex hypomorphism, those outcomes are not observed and the mice exhibit highly penetrant metastatic breast cancer. Deficiencies in other DDR components such as 53BP1 or mediators of apoptosis have little or no impact on the penetrance of neuT-induced malignancy in that experimental setting (Gupta et al., 2013). Several lines of evidence also indicate that the Mre11 complex is critical for the process of DNA replication. Among them: Mre11 complex components are physically associated with the replication fork in normal as well as stressed conditions (Sirbu et al., 2013); the complex is required for viability of proliferating cells but dispensable for that of quiescent cells (Adelman et al., 2009); and the association of the complex with chromatin is qualitatively and quantitatively distinct in S phase compared to DNA damage induced association (Maser et al., 2001; Mirzoeva and Petrini, 2003). Collectively, these observations underscore the fact that with respect to preserving genomic integrity, DNA replication is an important nexus of regulation in normal as well as pathologic states, and that the Mre11 complex plays a central role at that nexus. Whereas Mre11 and Rad50 orthologs are readily identifiable in all branches of life, Nbs1 (or Xrs2 in S. cerevisiae) orthologs are found only in Eukarya (Stracker and Petrini, 2011). Nbs1 interacts with Mre11 via a bipartite domain near its C terminus (Schiller et al., 2012). We previously derived a series of Nbs1 alleles that targeted the Nbs1-Mre11 interface (called Nbs1mid mutants for Mre11 interaction domain) so that the functionality of Nbs1 in isolation from the core Mre11-Rad50 complex could be assessed. The alleles that most severely impaired the interaction (Nbs1mid5 and Nbs1mid8) were lethal in MEFs and embryos. Conversely, a 108 amino acid fragment of Nbs1 that contained the bipartite Mre11 binding interface was sufficient to confer viability in MEFs as well as in the hematopoietic system (Kim et al., 2017). These data indicate that the essential function of Nbs1 is to stabilize and promote assembly of the active form of the Mre11-Rad50 core complex. In this study, we used a hematopoietic cell specific cre (crevav) (Stadtfeld and Graf, 2005) to test the hypothesis that the Nbs1mid8 gene product, which lacks four amino acids of the Mre11 interaction domain, specified sufficient residual function to support viability in the bone marrow. The hematopoietic compartment was chosen for this experiment because it is dispensable for embryogenesis and even severe deficits in hematopoietic development are compatible with postnatal viability in mice. crevav was expressed in compound heterozygous mice containing floxed NBS1 (Nbs1flox) (Demuth et al., 2004) and Nbs1mid8 alleles to establish mice expressing only Nbs1mid8 in hematopoietic lineages. In contrast to Nbs1flox/flox mice, which upon crevav expression were Nbs1 deficient in the bone marrow and inviable, mice expressing Nbs1mid8 in hematopoietic lineages were viable postnatally, albeit with severe defects in hematopoiesis, and decrements in the levels of all hematopoietic components. Nbs1mid8-expressing mice developed aggressive T cell malignancy which uniformly exhibited amplification and overexpression of MRE11 as well as CHK1 during the course of development and tumorigenesis. In Nbs1-/mid8 MEFs, co-overexpression of MRE11 and CHK1 was required for viability; overexpression of MRE11 alone did not rescue Nbs1-/mid8 cellular lethality. The increased abundance of Mre11 appears to be required to mitigate the weakened interaction with Nbs1mid8 in vivo. These data support the interpretation that the essential role of Nbs1 to mediate assembly of the functional form of the Mre11 complex. Each member of the Mre11 complex is essential for viability at the cellular and embryonic levels. Genetic analyses of Mre11 and Rad50 have provided insights regarding their essential functions, whereas the essential role of Nbs1 has been less clear (Stracker and Petrini, 2011). Recently, we showed that the Mre11 interaction domain of Nbs1 is necessary and sufficient for cellular viability, and that Nbs1’s role is to promote assembly, activity, and nuclear localization of the Mre11 complex (Kim et al., 2017). In that study, a series of alleles in mice that impair the Nbs1 Mre11 interaction to varying extents were derived (Nbs1mid mice). The Nbs1mid8 allele, in which coding sequence for four amino acids is deleted from the Mre11 interaction domain (LKNFKKFKK; bold underlined amino acids deleted), abolishes ATM activation, was found to be embryonic lethal, and was unable to support the viability of immortalized murine embryonic fibroblasts (MEFs) (Kim et al., 2017). The Mre11 complex is required for hematopoiesis (Adelman et al., 2009; Balestrini et al., 2016; Callen et al., 2007; Reina-San-Martin et al., 2005). We asked whether the Nbs1mid8 gene product had sufficient residual function to allow hematopoietic stem cells expressing only Nbs1mid8 to support hematopoietic development. We chose hematopoiesis because although it is essential for postnatal viability, relatively severe defects are tolerated. And, we reasoned that amidst the abundant cellularity of the hematopoietic system, productive assemblies of Nbs1mid8 with the Mre11-Rad50 core might occur at a sufficient frequency to promote the development of at least a pauciclonal hematopoietic compartment if Nbs1mid8 retained some functionality. Nbs1mid8 mice were crossed to Nbs1flox mice (Demuth et al., 2004). The ensuing Nbs1flox/mid8 mice were then crossed to vavcre in which cre expression is restricted to hematopoietic stem cells (Stadtfeld and Graf, 2005) to create Nbs1-/mid8 vavcre mice (hereafter Nbs1-/mid8vav mice). For the experiments described below, control mice include Nbs1flox/+ vavcre (hereafter Nbs1-/+vav) and Atmfloxlflox vavcre (hereafter Atm-/-vav). As expected, Nbs1flox/flox vavcre mice, in which hematopoietic cells are completely Nbs1 deficient exhibited perinatal lethality, succumbing at approximately two weeks to severe anemia (n = 13). In contrast, Nbs1-/mid8vav mice were viable and born at normal Mendelian ratios, indicating that the Nbs1mid8 gene product is partially functional. Nbs1-/mid8 MEFs are inviable, and prior to death the cells exhibit severe genome instability and defective ATM activation (Kim et al., 2017). Hence, the viability of Nbs1-/mid8vav bone marrow components was unexpected, and suggested the possibility of underlying compensatory genetic changes. Hematopoiesis was severely impaired in Nbs1-/mid8vav mice and did not phenocopy Atm-/-vav. Peripheral blood counts at six to eight weeks of age showed that both WBC and RBC numbers were decreased drastically in Nbs1-/mid8vav compared to Nbs1-/+vav mice, WBC; 8.66 ± 0.76 vs. 1.01 ± 0.14 (x106/ml), RBC; 9.99 ± 0.38 vs. 2.51 ± 0.62 (x109/ml) (Figure 1A and B). The percentage of both peripheral T cells and B cells also decreased in Nbs1-/mid8vav, T cell (%); 36.4, 26.7 vs. 0.4, 7.6, 9.8, B cell (%); 50.9, 58.4 vs. 2.9, 1.6, 8.3 (Figure 1D and E). Nbs1-/mid8vav mice also exhibited a two fold elevation in platelet levels, likely a consequence of anemia (Figure 1C). Figure 1. Nbs11-/mid8vav allele leads to hematopoiesis failure. (A-C) Peripheral blood counts analysis of Nbs1-/mid8vav mice at 6-8 week-old. (A) white blood cells (WBC), (B) red blood cells (RBC) and (C) platelet, n=8 mice of each genotype, mean ± SD, unpaired t test. (D) Percent CD3+ cells from peripheral blood. (E) Percent B220+ cells from peripheral blood. Each bar represents the data from individual mouse. (F) The number of thymocytes decreases in Nbs1-/mid8vav mice, n=5 of Nbs1-/+vav, n=6 of Nbs1-/mid8vav, n=6 of Atm-/-vav, mean ± SD, unpaired t test. (G) The number of bone marrow cells decreases in Nbs1-/mid8vav mice, n=4 of Nbs1-/+vav, n=5 of Nbs1-/mid8vav, n=4 of Atm-/-vav, mean ± SD, unpaired t test. The cellularity of the thymus and bone marrow was also markedly decreased in Nbs1-/mid8vav mice (Figure 1F and G). Analysis of Nbs1-/mid8vav bone marrow was carried out at 6-8 weeks of age. The percentage of B lineage cells (B220+) and myeloid cell (Mac-1+ and Gr-1+ cells) were decreased in Nbs1-/mid8vav mice compared to Nbs1-/+vav. B and myeloid lineages were reduced by roughly three fold (B: 25.03% ± 1.47 vs. 7.23 ± 0.92; myeloid 36.6% ± 2.83 vs. 14.32 ± 1.79). The levels of erythroid precursors (Ter119+ cells) were not changed (Figure 2A-C). Figure 2. Depletion of B cell lineage cells in Nbs1-/mid8vav bone marrow. (A) Percent B cell (B220+ cells) from bone marrow (BM) of indicated genotypes, n=5 of Nbs1-/+vav, n=7 of Nbs1-/mid8vav, n=6 of Atm-/-vav, mean ± SD, unpaired t test. (B) Percent myeloid cell (Mac-1+ and Gr-1+ cells) from BM of indicated genotypes, n=4 of Nbs1-/+vav, n=5 of Nbs1-/mid8vav, n=4 of Atm-/-vav, mean ± SD, unpaired t test. (C) Percent Erythroid cell (Ter119+ cells) from BM of indicated genotypes, n=6 of Nbs1-/+vav, n=7 of Nbs1-/mid8vav, n=6 of Atm-/-vav, mean ± SD, unpaired t test. (D) Representative scatter plot for B cell analysis of indicated genotypes. 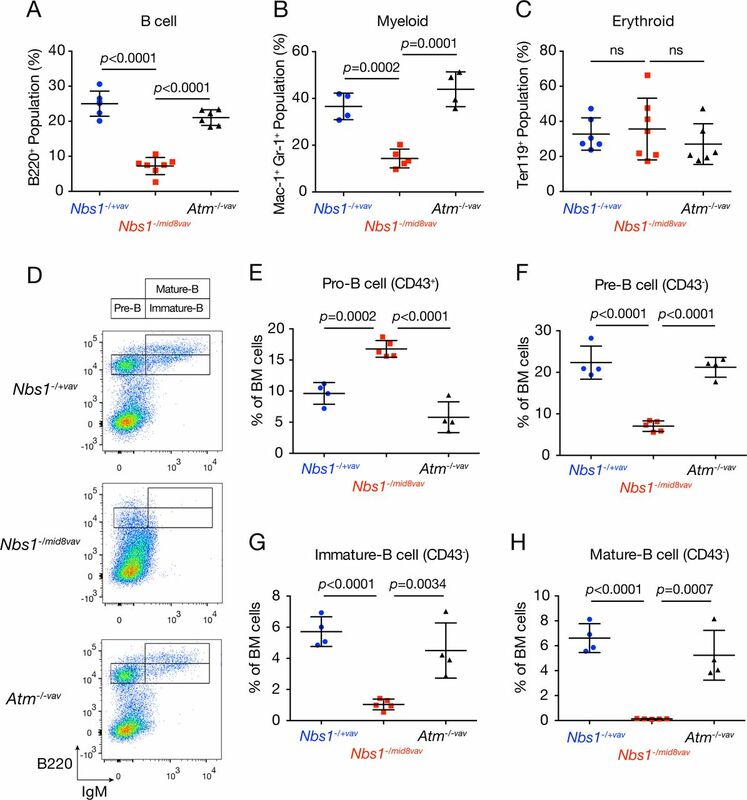 (E) Percent pro-B cells (CD43+) from BM. (F) Percent pre-B cells (CD43-, B220+, IgM-) from BM. (G) Percent immature-B cells (CD43-, B220+, IgM+) from BM. (H) Percent mature-B cells (CD43-, B220+high, IgM+) from BM cells. (E-H) Graphs show the data of indicated genotypes, n=4 of Nbs1-/+vav, n=5 of Nbs1-/mid8vav, n=4 of Atm-/-vav, mean ± SD, unpaired t test. The depletion of B cell lineage cells appeared to coincide with onset of immunoglobulin gene assembly. Whereas pro-B cells (CD43+) from Nbs1-/mid8vav were increased (Figure 2E), the levels of B220+ cells decreased beginning at the pre B stage when immunoglobulin heavy chain rearrangement commences (Alt et al., 2013; Teng and Schatz, 2015) to the immature B cell stage (CD43-), and IgM+ mature B cells were virtually undetectable (Figure 2F-H). These data suggest that Nbs1-/mid8vav cells are unable to resolve DSBs formed during the course of B cell development, reminiscent of previous analyses of lymphocyte development in Mre11 complex mutants (Balestrini et al., 2016; Callen et al., 2007; Deriano et al., 2009; Helmink et al., 2009). The hematopoietic phenotype of Nbs1-/mid8vav mice is distinct from that of Atm-/-vav in all respects (Figure 1E-G, and Figures 2A-H), underscoring the point that the Nbs1-/mid8vav phenotype reflects both the loss of both Mre11 complex DSB repair functions and ATM activation. In light of the predisposition to thymic lymphomas in Atm-/- mice, we monitored a cohort of Nbs1-/mid8vav mice for 12 months to assess the risk of malignancy. With 5.6 month of mean tumor free survival, 90% (18/20) of Nbs1-/mid8vav developed hematologic malignancy, a significantly higher penetrance than that of Atm-/-vav (Balestrini et al., 2016) (Figure 3A). In addition to exhibiting higher penetrance, the malignancies were distinct from those arising in Atm-/-vav. Most Nbs1-/mid8vav tumors (17/18) were aggressive T cell lymphomas or leukemias (Table 1) which became disseminated to the spleen (Figure 3B ii and iii). (A) Mouse tumor free survival. Each data point represents the percent survival of mice with Nbs1-/+vav and Nbs1-/mid8vav at a given age. N denotes total number of mice for each genotype and the average age in death in days is shown. ND means not determined. Note that the Atm-/-vav survival curve was previously established in our colony and reported (Balestrini et al., 2016). (B) CD3 immunohistochemistry of thymus (i and ii) and spleen (iii and vi); control IgG (i), CD3 antibody (ii, iii, and vi), thymus (i and ii) and spleen (iii) from tumor bearing Nbs1-/mid8vav mouse, and spleen (vi) from littermate Nbs1-/+vavmouse. Scale bar = 100 μm. (C) CD4 and CD8 flow cytometry of thymic tumor cells from Nbs1-/mid8vav mice. (D) CD3 flow cytometry of thymic tumor cells from Nbs1-/+vav or +/+vavmice and Nbs1-/mid8vav mice. The numbers above the scatter plots or histograms are the mouse identification number (C and D). Whereas Atm-/-vav tumors exhibit a relatively immature phenotype (CD3low CD4+ CD8+) (Zha et al., 2010), Nbs1-/mid8vav tumors were predominantly single positive (CD8+) in half of the cases examined CD3high (Figure 3C and D). Flow cytometric analysis of thymocyte populations at six weeks of age reveal the CD8+ population is elevated in Nbs1-/mid8vav thymus compared to Nbs1-/+ or Atm-/- thymus (Figure S1) prior to the emergence of malignant cells. To gain insight regarding the underlying genetic changes that suppressed the lethality of the Nbs1mid8 allele, we carried out genomic analyses of Nbs1-/mid8vav tumors. Analysis of copy number variation (CNV) indicated the presence of multiple broad DNA copy number gains and losses, with recurrent CNV on chromosomes 9 and 15 (Figure 4A). A focal amplification of 9qA2 was present in all tumors albeit with variable amplitudes and breakpoints (Figure S2). This region includes the genes encoding MRE11 and CHK1. Chromosome 9 amplification appears to be unique to Nbs1-/mid8vav tumors as amplification of this region has not been observed in thymic lymphomas from p53 or ATM deficient mice (Dudgeon et al., 2014; Genik et al., 2014; Zha et al., 2010). Thus, the evolution of Nbs1-/mid8vav malignancy is distinct. Figure 4. Genomic analysis of Nbs1-/mid8vav T cell lymphoma. (A) Heapmap of copy number variation (CNV) of 9 thymic tumors lymphomas from Nbs1-/mid8vav mice. Analysis was performed using whole genome sequencing or deep targeted sequencing of 578 key cancer-associated genes. (B) Western blot for ATM signaling and the levels of Mre11 complex in Nbs1-/mid8vav thymic tumors. IR-induced phosphorylation of KAP1 (S824) was assessed upon different dose of IR as indicated. The levels of MRE11, NBS1 and RAD50 were assessed. Note that MRE11 and RAD50 levels are increased. (C) CNV of MRE11, CHK1, NBS1, and MYC genes from thymocytes of wild type and Nbs1-/mid8vav mice at the age of 4 and 9 weeks. Relative copy numbers for genes over ACTIN signals of each biological sample were shown, n=5 of Nbs1+/+vav (4 week-old), n=7 of Nbs1-/mid8vav (4 week-old), n=6 of Nbs1+/+vav (9 week-old), n=7 of Nbs1-/mid8vav (9 week-old), mean ± SD, unpaired t test. (D) Oncoprint of genomic alterations of Nbs1-/mid8vav T cell lymphoma. Note that Nbn mutation is Nbs1mid8 allele (N682_K685del). Complete mutation list is presented in supplemental Table 1. The mouse identification numbers are indicated (A and D). Amplification was correlated with increased protein levels of Mre11 in Nbs1-/mid8 thymic tumors. Although there was no CNV for the Rad50 gene, Rad50 protein levels were also increased (Figure 4B). We propose that Nbs1-/mid8vav cells select for amplification and overexpression of Mre11 to compensate for the meta-stable interaction with the Nbs1mid8 gene product and thereby permit cell survival. The increased levels of Mre11 in Nbs1-/mid8vav tumors did not fully suppress the Nbs1mid8 phenotype, as IR-induced Kap1 S824 phosphorylation, an index of ATM activation was not restored (Figure 4B). In this context, we sought to define when these two gene amplifications occurred in the transition to malignancy. We measured the copy numbers of genes that are present in chromosomes 9 or 15 at earlier times (4 and 9 week-old) prior to the age of tumor onset. Increased copy number of the MRE11 and CHK1 genes on chromosome 9 was detected in Nbs1-/mid8 thymocytes as early as four weeks of age (1.46-fold for MRE11; 1.48-fold for CHK1) while the NBS1 copy number was not altered (Figure 4C). MYC amplification on chromosome 15 was also detected in thymocytes of four week-old Nbs1-/mid8 mice (1.38-fold), suggesting that amplifications on both chromosomes 9 and 15 occurred at an early stage in the leukemogenic process, presumably reflecting selection pressure for cell survival. The finding of CHK1 amplification in Nbs1-/mid8vav T cell leukemias was reminiscent of the fact that human T-ALL commonly exhibits CHK1 overexpression, and are exquisitely sensitive to Chk1 inhibition (Sarmento et al., 2015). Because the MRE11 and CHK1 loci are linked on chromosome 9, it is unclear whether their respective copy number increases are independent events or occurred simultaneously. Deep targeted sequencing of 578 key cancer-associated genes to identify potential drivers of T-ALL in Nbs1-/mid8vav mice revealed that the mutational features of Nbs1-/mid8vav tumors were consistent with those of T-cell acute lymphoblastic leukemia (T-ALL) in humans and are similar, but not identical to lymphomas arising in Atm-/- mice. Nbs1-/mid8vav leukemias uniformly contained activating mutations of Notch1 which are mainly restricted to the PEST domain of the NOTCH1 protein (Table S1 and Figure S3) as seen in human T-ALL (Weng et al., 2004). Amplification or activating mutations in Notch1 have been also been noted in thymic lymphomas arising in ATM deficient mice (Zha et al., 2010). Those lymphomas also contain trisomy 15 and Nbs1-/mid8vav tumors similarly appear to have whole chromosome 15 duplications (Figure 4A) (Zha et al., 2010). Beyond Notch1, mutations of other potential driver genes were found at various frequencies in Nbs1-/mid8vav tumors (Figure 4D and Table S1). Trp53 mutations within the DNA binding domain were found with a high frequency, and were frequently biallelic due to LOH (Figure 4D and Figure S3). The two mutations observed (S238P corresponding to human S241 and truncation of oligomerization domain) affect DNA binding and p53-mediated cell growth suppression functions (Fischer et al., 2016; Maki, 1999; Monti et al., 2002; Rajagopalan et al., 2010), suggesting that p53 deficiency may be a driver of Nbs1mid8VAV T-ALL. Other candidate driver mutations found in Nbs1-/mid8vav tumors including Arid5b, Bcl6, Bcor, and Ikzf1 (Figure 4D and Table S1). To test the interpretation that Mre11 amplification and overexpression are compensatory changes that can suppress Nbs1mid8 lethality, we overexpressed the murine Mre11 cDNA in Nbs1flox/mid8 creERT2 MEFs (Kim et al., 2017). In these cells, cre expression is activated by tamoxifen (4-OHT) to effect inactivation of the (wild type) Nbs1flox allele to create Nbs1-/mid8 cells. MRE11-expressing Nbs1flox/mid8 cells were treated with 4-OHT for 48 hrs, and plated. We were unable to establish viable colonies of MRE11-expressing Nbs1-/mid8. As noted above, the Mre11 complex plays an integral role in DNA replication (Stracker and Petrini, 2011; Syed and Tainer, 2018). Consistent with this interpretation, cells in which the Mre11 complex is impaired experience signs of DNA replication stress (Bruhn et al., 2014). On that basis, we tested the hypothesis that the co-amplification of the CHK1 locus uniformly observed (Figure 4A and C) is an obligate event for viability of Nbs1-/mid8vav. Therefore, CHK1 and MRE11 were co-overexpressed to determine whether this would rescue Nbs1-/mid8 lethality. After deletion of the conditional Nbs1 allele, cell clones which were Nbs1-/mid8 but overexpressed CHK1 and MRE11 emerged (hereafter referred to as Nbs1-/mid8 CM). Three independent Nbs1-/mid8 CM clones (#2, 7,and 8) were verified by PCR genotyping (data not shown) and RT-PCR/sequencing confirmed that the sole source of RNA for Nbs1 protein is Nbs1mid8 mutant allele (Figure S4). The Nbs1-/mid8 CM clones exhibited slower growth than the parental Nbs1F/mid8 CM cells (Figure 5A). Mre11 and Chk1 levels were increased in three Nbs1-/mid8 CM clones (Figure 5B). We also found that in clone #2, Nbs1 levels were also increased (Figure 5B) due to 7.7-fold amplification of the Nbs1mid8 locus in that clone (Figure 5C), likely in response to selective pressure imposed by the impaired interaction of Mre11 and Nbs1mid8. Figure 5. Increased expression of MRE11 and CHK1 genes rescues Nbs1-/mid8 MEFs from lethality. (A) Growth of three different stable clones of Nbs1-/mid8 MEFs expressing both exogenous MRE11 and CHK1. Nbs1flox/mid8 CM is a parental cell. Cells were plated (2 x 104) and counted at day 4, mean± SD, triplicates. Hereafter V, C, and M denote empty VECTOR, CHK1, and MRE11, respectively. (B) Western blots show the levels of MRE11, RAD50, NBS1, and CHK1 in three stable Nbs1-/mid8 CM clones. Nbs1flox/mid8 CM is a parental cell. (C) NBS1 gene amplification occurs in clone #2 of Nbs1-/mid8 CM. The values are relative copy numbers of NBS1 gene compared to that of parental Nbs1flox/mid8 CM cells. (D and E) Genomic instability in Nbs1-/mid8 MEFs was alleviated by ectopic expression of MRE11. (D) Percentage nuclei with 10 ≤ γH2AX foci and (E) metaphases with 2 ≤ aberrations were measured in Nbs1flox/mid8 CreERT2 MEFs expressing either MRE11 and Chk1 alone or in combination, 5 days post 4-OHT treatments. p value was determined by unpaired t test, mean ± SD, total more than 800 nuclei counted from 3 independent experiments for γH2AX foci (D) and Fisher’s exact test, *p<0.05, ns: not significant (E). (F) Summary of T cell lymphomagenesis in Nbs1-/mid8vav mice. Gross genomic instability of Nbs1-/mid8 T cells causes impairment in cell proliferation and developmental defects. Few cells that spontaneously gain MRE11 and CHK1 amplification escape from the cellular lethality. By acquiring additional tumor-prone mutations, these cells can transform into thymic lymphoma. To assess whether MRE11 and CHK1 overexpression alleviate DNA damage occurring in Nbs1-/mid8 cells, we compared γH2AX foci and metaphase spreads in cells overexpressing either MRE11 and CHK1 alone or in combination. Five days after deletion of the conditional Nbs1flox allele, the ensuing Nbs1-/mid8 cells exhibited multiple indices of DNA damage such as γH2AX foci and chromosomal aberrations (Figure 5D and E). Overexpression of MRE11 and CHK1 in combination mitigated those outcomes, reducing γH2AX; 41.8% vs. 19.7%, and metaphase aberrations; 43.8% vs. 20% (Figure 5D and E). Whereas CHK1 overexpression alone had no effect, MRE11 overexpression alone was sufficient to reduce DNA damage in Nbs1-/mid8 cells (Figure 5D and E) even though MRE11-expressing Nbs1-/mid8 clones were not ultimately viable. This indicates that although overexpression of MRE11 was sufficient to alleviate some of genomic instability of Nbs1mid8, coincident CHK1 overexpression was required for cell viability. In previous work, we established evidence that the essential function of Nbs1 was to stabilize and promote proper assembly and function of the Mre11 complex using biochemical approaches and atomic force microscopy. In Nbs1-/mid8 cells, Mre11 complex components are present at essentially normal levels, but Nbs1mid8 interaction with Mre11 is compromised, blocking viability. Four days after inactivation of the wild type allele in Nbs1flox/mid8 MEFs (prior to death), ATM activation was abolished and severe genomic instability was evident (Kim et al., 2017). In this study, we used the context of hematopoietic development to assess whether Nbs1mid8 retained residual function. 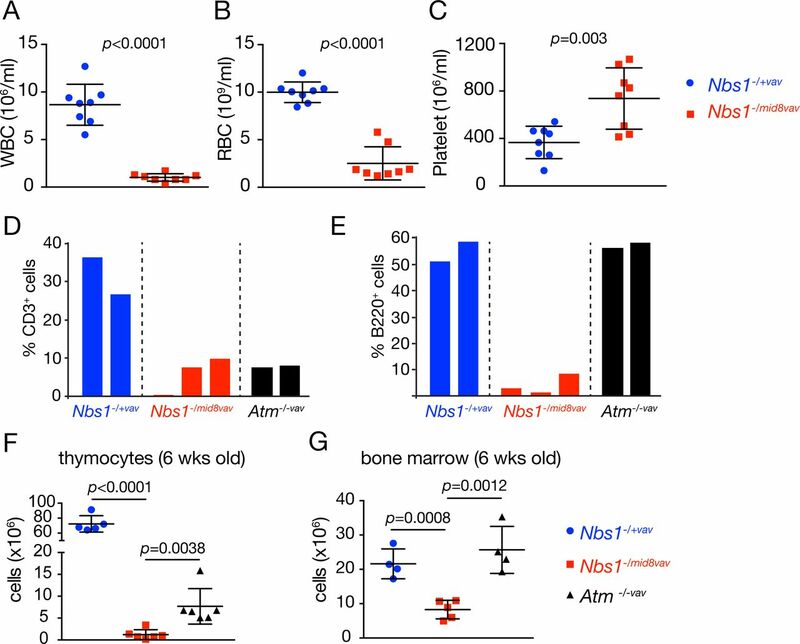 Whereas Nbs1 deficiency in the bone marrow led to peri-natal lethality due to anemia, Nbs1-/mid8vav mice were viable with a median lifespan of 169 days. Nbs1-/mid8vav succumbed to a highly aggressive T cell malignancy that bore some hallmarks of T-ALL in humans. Genomic analysis of Nbs1-/mid8vav cancers revealed copy number gains and overexpression of MRE11 and CHK1 in 100% of tumors analyzed. We were able to establish clonal Nbs1-/mid8 MEF cell lines only upon co-overexpression of MRE11 and CHK1, demonstrating that increased levels of both was required to suppress Nbs1mid8 lethality. Each member of the Mre11 complex is essential and none appear to function outside of the complex. Nevertheless, Nbs1 plays a distinct role in Mre11 complex stability. For example, mutations that reduce Nbs1 levels do not grossly alter the levels of Mre11 and Rad50 (Carney et al., 1998; Williams et al., 2002), whereas the stabilities of Mre11 and Rad50 are interdependent, so that mutations destabilizing either reduce the level of the other (Stewart et al., 1999; Theunissen et al., 2003). Hence, Mre11 and Rad50, which are present in all clades of life constitute the core of the Mre11 complex, while Nbs1, seen only in Eukarya has evolved to promote proper assembly and activity of the complex in eukaryotes. We propose that this function of Nbs1 underlies the selection for MRE11 amplification and overexpression in Nbs1-/mid8vav tumors. Based on principles of ligand binding equilibria, the weakened interaction between Nbs1mid8 and Mre11 would be partially mitigated if the levels of either Mre11 or Nbs1mid8 were elevated. This could increase the steady state level of productively assembled complexes to a threshold that would permit viability. Supporting this concept, in Nbs1-/mid8 CM clone 2, the Nbs1mid8 locus was also amplified and overexpressed (Figure 5B and C). This suppression is not complete, as the defect in Kap1 S824 phosphorylation upon IR treatment of Nbs1-/mid8vav tumors was not rescued (Figure 4B). We interpret this to mean that the levels of putatively assembled complexes were insufficient to allow for IR-induced ATM activation. Several mouse models of Mre11 complex hypomorphism have been described (Roset et al., 2014; Stracker and Petrini, 2011). No predisposition to malignancy has been observed in these mutants, although in some cases the latency of tumorigenesis associated with p53 or Chk2 mutations is reduced; presumably this reflects the combined effect of genome instability and checkpoint defects associated with those mutations. The strong cancer predisposition seen in Nbs1-/mid8vav is distinct from other Mre11 complex single mutants, and phenocopies that of Nbs1ΔB/ΔB Atm-/-vav mice. Two features of these mice likely underlie the similar outcomes (Balestrini et al., 2016). First, ATM activity is virtually absent in the former and completely absent in the latter, which means that in both contexts, DNA damage dependent cell cycle checkpoints and apoptotic induction are compromised. Second, both exhibit high degrees of genomic instability, which likely increases the probability of chromosome rearrangement and/or mutations that enhance progression to the malignant phenotype. In Nbs1-/mid8 MEFs, overexpression of MRE11 alone is not sufficient to restore viability. Co-overexpression of CHK1 was required to obtain stable clones (Figure 5B). This finding strongly suggests that amplification and overexpression of the MRE11 and CHK1 loci in Nbs1-/mid8vav T-ALL cells reflects the same requirement. Significantly increased copy numbers of both loci were observed as early as four weeks of age, supporting the interpretation that the overexpression of both genes is required for viability irrespective of the malignant phenotype. Whereas MRE11 overexpression in Nbs1-/mid8 MEFs mitigated the gross chromosome instability observed after cre meditated deletion of the Nbs1flox allele (Figure 5E), the requirement for CHK1 overexpression suggests an additional stress is imposed by the Nbs1mid8-containing Mre11 complex. It is likely that with the ATM-Mre11 complex axis of the DDR crippled by the Nbs1mid8 allele, selection for CHK1 overexpression is imposed by the genomic instability associated with severe Mre11 complex hypomorphism. In this scenario, Chk1 function may mitigate the lethal effects of DNA damage in parallel with its normal role in the response to DNA replication stress. DNA replication stress, broadly defined as a state in which progression of the replisome is impaired by DNA lesions or insufficiency of the nucleotide pool is an important source of DNA damage in proliferating cells. DNA replication stress also appears to be intrinsic to the premalignant and malignant phenotypes (Gaillard et al., 2015; Macheret and Halazonetis, 2015). The viability of cells experiencing DNA replication stress is largely dependent on the ATR-Chk1 axis of the DNA damage response (Schoppy et al., 2012; Zeman and Cimprich, 2014), and so the development of Chk1 and ATR inhibitors has emerged as a priority in cancer therapeutics (Pilie et al., 2018). Given its requirement for preserving genomic integrity during S phase (Adelman et al., 2009), it is also conceivable that the selection for CHK1 overexpression reflects that Mre11 complex depletion causes DNA replication stress in a manner analogous to depletion of MCM proteins and other replisome components (Hills and Diffley, 2014), a state that acutely requires Chk1 activity to maintain viability (Gaillard et al., 2015; Schoppy et al., 2012). Cytologic analyses of acute Nbs1 depletion in MEFs offered the suggestion that the Mre11 complex’s role in resolving DNA replication intermediates underlies its essentiality (Bruhn et al., 2014). Perhaps consistent with that view, we have shown that Mre11 complex foci arise during unperturbed S phase. Those foci do not colocalize with DSB markers such as γH2AX or BRCA1, but colocalize with PCNA throughout S phase (Maser et al., 2001; Mirzoeva and Petrini, 2003). Hence, they do not appear to be associated with DSBs and could potentially represent DNA replication intermediates that precede fork collapse and DSB formation. An additional possibility is that the Mre11 complex is situated at the fork to degrade secondary structures on the lagging strand and thereby drive sister chromatid recombination as has been suggested in bacteria and S. cerevisiae (Connelly and F., 1996; Connelly et al., 1998; Lobachev et al., 2002). Whatever the source of the initiating DSBs, the Mre11 complex is acutely required for sister chromatid recombination (Stracker and Petrini, 2011), a function that could also account for Chk1 activation upon depletion as well as the complex’s association with the fork under normal conditions. Genomic analysis of Nbs1mid8 leukemias revealed a similar patter of mutations to that found in human T-ALL (Sarmento et al., 2015; Weng et al., 2004). The Notch1 mutations were found in 6 tumors out of 7 samples analyzed and the mutations were restricted to the PEST domain, as seen in human T-ALL and also T-ALL arising in Atm-/-vav mice (Weng et al., 2004; Zha et al., 2010). This suggests that Notch1 mutations could be the main driver for T-ALL tumors. Other mutations found in Nbs1-/mid8vav leukemias are also known human tumor mutations. For example, Bcl6, Bcor, and Ikzf1 are found mutated in human T-ALL and B-ALL (Kastner and Chan, 2011; Mullighan et al., 2008). Bcl6 is a regulator for germinal center reaction and found deregulated in ~40 % diffuse large B-cell lymphomas (DLBCL) by translocation (Butler et al., 2002; Lo Coco et al., 1994; Ye et al., 1993). Loss of function mutations in Bcor has been noted in hematopoietic malignancies (Damm et al., 2013; Grossmann et al., 2011). In this regard, Nbs1-/mid8vav may provide an in vivo model for examining the contributions of the various driver mutations in T-ALL and other malignancies in the context of Mre11 complex hypomorphism. The Mre11 complex plays a critical role in preventing oncogene induced carcinogenesis in mammary epithelium (Gupta et al., 2013). It is conceivable that Mre11 complex hypomorphism in Nbs1-/mid8vav cells similarly creates a permissive state for oncogene driven proliferation and malignancy. The data presented here reveal that Nbs1 meets the definition of a tumor suppressor in hematopoietic cells via its role in ATM activation and in DNA repair. Therefore, the tumor suppressive functions defined in the epithelium appear to be recapitulated in the hematopoietic compartment. Further examination of genetic interactions between Mre11 complex hypomorphism and oncogenic driver mutations in hematologic malignancy will shed light on the mechanisms underlying the tumor suppressive role of the Mre11 complex in this context. The generation of Nbs1mid8, Nbs1flox/flox vavcre, and Atmflox/flox vavcre mice were previously described (Balestrini et al., 2016; Kim et al., 2017). Nbs1flox/mid8 vavcre mice were generated by crossing with Nbs1flox and vavcre mice. For tumor watch, the cohorts were maintained according to the protocol approved by the Institutional Animal Care and Use Committee of Memorial Sloan Kettering Cancer Center. Tumor samples from the sacrificed mice were fixed with 4% (v/v) formaldehyde overnight at 4°C and stored at 4°C in 70% ethanol. CD3 antibody (ab16669, Abcam) was used for immunohistochemistry. Eight micrometer sections of paraffin-embedded samples were stained with Hematoxylin and Eosin (H&E) for pathological analysis. Histopathology was performed by Histoserv, Inc. (Maryland, USA). Mouse embryo fibroblasts (MEFs) were cultured in DMEM/10% cosmic calf serum. Inducible Nbs1flox/mid8 MEFs were generated by stable expression of MSCV CreERT2 puro (a gift from Tyler Jacks; Addgene plasmid #22776). Stable CHK1 or/and MRE11 expressing Nbs1flox/mid8 CreERT2 MEFs were made by retroviral expression of CHK1 or MRE11 in pMIG-W-IRES-GFP plasmid (a gift from Luk Parjis; Addgene plasmid #12282). Then, inducible Nbs1 allele was removed by 4-OHT treatment. After deletion of inducible Nbs1 allele, individual surviving clones were tested by PCR genotyping and Sanger sequencing of amplified region by RT-PCR to verify absence of wild type Nbs1 allele expression. Three independent Nbs1-/mid8 CHK1+MRE11 MEFs clones were established. Peripheral blood was collected from the tail vein. A compete peripheral blood count was measured using a Hemavet 950 (Drew Scientific). Thymus and femurs from 6-8 week old mice were harvested and subjected to red blood cell lysis (00-4333-57, Invitrogen). Thymocytes and bone marrow cells were counted by Beckman Coulter Z1 counter. Antibodies used for flow cytometry are CD8 (553030, BD Bioscience), CD4 (557308, BD Bioscience), CD3 (100214, Biolegend), B220 (562922, BD Bioscience, 103212, Biolegend), CD43 (553270, BD Bioscience), IgM (562032, BD Bioscience), Mac-1 (557397, BD Bioscience), Gr-1 (553126, BD Bioscience), Ter119 (116223, Biolegend), and Isotype ctrl (400120, Biolegend). Tumor samples along with normal samples taken from the tails of unaffected littermates underwent either a custom-capture and deep sequencing assay of 578 established cancer genes called Mouse Integrated Mutation Profiling of Actionable Cancer Targets (M-IMPACT) or low-pass whole-genome sequencing (WGS) for additional DNA copy number analyses. Tumors were sequenced with M-IMPACT to an average 300.9-fold coverage. Analysis for somatic point mutations and small insertions and deletions along with DNA copy number changes in these data was performed a previously described (Pronier et al., 2018). Tumors were sequenced by low-pass WGS to an average of 4.9-fold coverage. DNA copy number alterations were identified summarizing read coverage in 50kb non-overlapping windows across the genome followed by GC-content normalization using a lowess fit. We then performed circular binary segmentation (alpha of 1e-5 and undo.SD of 5) (Venkatraman and Olshen, 2007). Structural variants were identified using delly v0.6.1 (Rausch et al., 2012). For metaphase spread, cells were treated with 100 ng/ml of KaryoMAX colcemid (Life technologies) for 1 hr and harvested. Cells were hypotonically swelled in 0.075 M KCl for 15 min at 37°C and fixed in ice-cold 3:1(v/v) methanol: acetic acid. Dropped samples on slides were stained with 5% Giemsa (Sigma) and mounted with Permount medium (Fisher Scientific). Analyses were carried out on blinded samples. For immunofluorescence staining, cells were fixed in 4% (v/v) paraformaldehyde for 15 min at room temperature and permeabilized in 0.5% (v/v) TritonX-100 for 10 min at room temperature before primary antibody incubation. Phospho-H2AX (Ser139) antibody was used (05-636, Millipore) at 1:5000 dilution and secondary antibody (Alexa-594, Life technologies) was used at 1:1000 dilution. Staining PBS buffer contains 1% BSA and 0.1% (v/v) Tween 20. Western blots were performed by standard protocol. Total cells extracts were prepared in SDS lysis buffer (60 mM Tris-HCl pH 6.8, 2% SDS) and boiled for 5 min to shear genomic DNA. Twenty microgram of extracts were analyzed for western blot. Antibodies used in this study were MRE11 (custom made), NBS1 (custom made), RAD50 (custom made), p-KAP1 S824 (ab70369, Abcam), total KAP1 (NB500-159, Novus), CHK1 (sc-8408, Santa Cruz), and a-TUBULIN (T9026, Sigma). Genomic DNAs were isolated using GeneJET Genomic DNA Purification Kit (Thermo) and qPCRs were performed using SsoAdvanced™ Universal SYBR® Green Supermix (Bio Rad). Specific mouse primer set sequences are MRE11; 5’-TCACACTGGATTGGATCTTCCAAGTG-3’, 5’-CTATAGAGTGAGATCCAGAACAGCCA-3’, NBS1; 5’-GCCTTCTAGGTGGACATGCT-3’, 5’-TCTGGCACCTGAACTTTGTGT-3’, Chk1; 5’-ATCCTTACCTCCAGCCAACATTGCAGT-3’, 5’-ACGCTTACTGAACAAGATGTGTGGGACT-3’, MYC; 5-GCTGTTTGAAGGCTGGATTTCCT-3, 5’-CAGATGAAATAGGGCTGTACGGAGTC-3’, ACTIN; 5’-CCTCTACATTCATTGTAGGCCACCACA-3’, 5’-CTTCTGAGTTTGGGATGCTGTGAGTG-3’). J. Kim performed experiments; J. Kim, A. Pension, B. Taylor, and J. Petrini analyzed the data and wrote the paper; J. Kim, and J. Petrini designed the study. We thank Fred Alt for ATMflox mice, Matthias Stadtfeld and Thomas Graf for vavcre mice, the MSK Integrated Genomics Operation, and members of the Petrini lab, including Thomas J. Kelly for helpful discussion throughout the course of this study. This work was supported by GM59413 (J.H.J.P), U54 OD020355 (J.H.J.P and B.S.T. ), R01 CA207244 (B.S.T. ), R01 CA204749 (B.S.T. ), and the American Cancer Society (RSG-15-067-01-TBG), Anna Fuller Fund, and the Josie Robertson Foundation (B.S.T. ), the Cycle for Survival, and the MSK Cancer Center core grant P30 CA008748. Adelman, C.A., S. De, and J.H. Petrini. 2009. Rad50 is dispensable for the maintenance and viability of postmitotic tissues. Molecular and cellular biology 29:483–492. Alt, F.W., Y. Zhang, F.L. Meng, C. Guo, and B. Schwer. 2013. Mechanisms of programmed DNA lesions and genomic instability in the immune system. Cell 152:417–429. Balestrini, A., L. Nicolas, K. Yang-Lott, O.A. Guryanova, R.L. Levine, C.H. Bassing, J. Chaudhuri, and J.H. Petrini. 2016. Defining ATM-Independent Functions of the Mre11 Complex with a Novel Mouse Model. Molecular cancer research: MCR 14:185–195. Bruhn, C., Z.W. Zhou, H. Ai, and Z.Q. Wang. 2014. The essential function of the MRN complex in the resolution of endogenous replication intermediates. Cell reports 6:182–195. Butler, M.P., S. Iida, D. Capello, D. Rossi, P.H. Rao, P. Nallasivam, D.C. Louie, S. Chaganti, T. Au, R.D. Gascoyne, G. Gaidano, R.S. Chaganti, and R. Dalla-Favera. 2002. Alternative translocation breakpoint cluster region 5’ to BCL-6 in B-cell non-Hodgkin’s lymphoma. Cancer research 62:4089–4094. Callen, E., M. Jankovic, S. Difilippantonio, J.A. Daniel, H.T. Chen, A. Celeste, M. Pellegrini, K. McBride, D. Wangsa, A.L. Bredemeyer, B.P. Sleckman, T. Ried, M. Nussenzweig, and A. Nussenzweig. 2007. ATM prevents the persistence and propagation of chromosome breaks in lymphocytes. Cell 130:63–75. Carney, J.P., R.S. Maser, H. Olivares, E.M. Davis, M. Le Beau, J.R. Yates, 3rd, L. Hays, W.F. Morgan, and J.H. Petrini. 1998. The hMre11/hRad50 protein complex and Nijmegen breakage syndrome: linkage of double-strand break repair to the cellular DNA damage response. Cell 93:477–486. Ciccia, A., and S.J. Elledge. 2010. The DNA damage response: making it safe to play with knives. Molecular cell 40:179–204. Connelly, J.C., and L.D.R. F. 1996. The sbcC and sbcD genes of Escherichia coli encode a nuclease involved in palindrome inviability and genetic recombination. Genes to Cells 1:285–291. Connelly, J.C., L.A. Kirkham, and D.R. Leach. 1998. The SbcCD nuclease of Escherichia coli is a structural maintenance of chromosomes (SMC) family protein that cleaves hairpin DNA. Proc. Natl. Acad. Sci. USA 95:7969–7974. Damm, F., V. Chesnais, Y. Nagata, K. Yoshida, L. Scourzic, Y. Okuno, R. Itzykson, M. Sanada, Y. Shiraishi, V. Gelsi-Boyer, A. Renneville, S. Miyano, H. Mori, L.Y. Shih, S. Park, F. Dreyfus, A. Guerci-Bresler, E. Solary, C. Rose, S. Cheze, T. Prebet, N. Vey, M. Legentil, Y. Duffourd, S. de Botton, C. Preudhomme, D. Birnbaum, O.A. Bernard, S. Ogawa, M. Fontenay, and O. Kosmider. 2013. BCOR and BCORL1 mutations in myelodysplastic syndromes and related disorders. Blood 122:3169–3177. Demuth, I., P.O. Frappart, G. Hildebrand, A. Melchers, S. Lobitz, L. Stockl, R. Varon, Z. Herceg, K. Sperling, Z.Q. Wang, and M. Digweed. 2004. 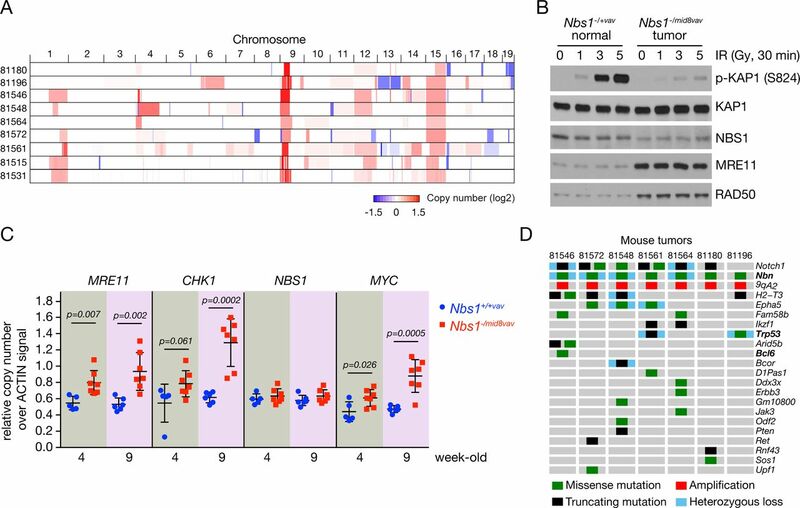 An inducible null mutant murine model of Nijmegen breakage syndrome proves the essential function of NBS1 in chromosomal stability and cell viability. Hum Mol Genet 13:2385–2397. Deriano, L., T.H. Stracker, A. Baker, J.H. Petrini, and D.B. Roth. 2009. Roles for NBS1 in alternative nonhomologous end-joining of V(D)J recombination intermediates. Molecular cell 34:13–25. Dudgeon, C., C. Chan, W. Kang, Y. Sun, R. Emerson, H. Robins, and A.J. Levine. 2014. The evolution of thymic lymphomas in p53 knockout mice. Genes & development 28:2613–2620. Fischer, N.W., A. Prodeus, D. Malkin, and J. Gariépy. 2016. p53 oligomerization status modulates cell fate decisions between growth, arrest and apoptosis. Cell Cycle 15:3210–3219. Gaillard, H., T. Garcia-Muse, and A. Aguilera. 2015. Replication stress and cancer. Nat Rev Cancer 15:276–289. Genik, P.C., H. Bielefeldt-Ohmann, X. Liu, M.D. Story, L. Ding, J.M. Bush, C.M. Fallgren, and M.M. Weil. 2014. Strain background determines lymphoma incidence in Atm knockout mice. Neoplasia 16:129–136. Grossmann, V., E. Tiacci, A.B. Holmes, A. Kohlmann, M.P. Martelli, W. Kern, A. Spanhol-Rosseto, H.U. Klein, M. Dugas, S. Schindela, V. Trifonov, S. Schnittger, C. Haferlach, R. Bassan, V.A. Wells, O. Spinelli, J. Chan, R. Rossi, S. Baldoni, L. De Carolis, K. Goetze, H. Serve, R. Peceny, K.A. Kreuzer, D. Oruzio, G. Specchia, F. Di Raimondo, F. Fabbiano, M. Sborgia, A. Liso, L. Farinelli, A. Rambaldi, L. Pasqualucci, R. Rabadan, T. Haferlach, and B. Falini. 2011. Whole-exome sequencing identifies somatic mutations of BCOR in acute myeloid leukemia with normal karyotype. Blood 118:6153–6163. Gupta, G.P., K. Vanness, A. Barlas, K.O. Manova-Todorova, Y.H. Wen, and J.H. Petrini. 2013. The mre11 complex suppresses oncogene-driven breast tumorigenesis and metastasis. Molecular cell 52:353–365. Helmink, B.A., A.L. Bredemeyer, B.S. Lee, C.Y. Huang, G.G. Sharma, L.M. Walker, J.J. Bednarski, W.L. Lee, T.K. Pandita, C.H. Bassing, and B.P. Sleckman. 2009. MRN complex function in the repair of chromosomal Rag-mediated DNA double-strand breaks. J Exp Med 206:669–679. Hills, S.A., and J.F. Diffley. 2014. DNA replication and oncogene-induced replicative stress. Curr Biol 24:R435–444. Kastner, P., and S. Chan. 2011. Role of Ikaros in T-cell acute lymphoblastic leukemia. World journal of biological chemistry 2:108–114. Kim, J.H., M. Grosbart, R. Anand, C. Wyman, P. Cejka, and J.H.J. Petrini. 2017. 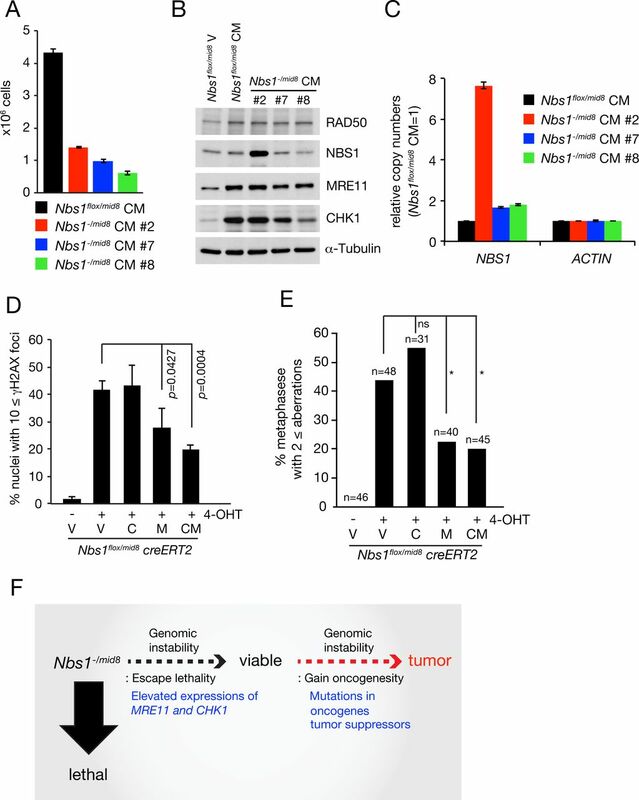 The Mre11-Nbs1 Interface Is Essential for Viability and Tumor Suppression. Cell reports 18:496–507. Lo Coco, F., B.H. Ye, F. Lista, P. Corradini, K. Offit, D.M. Knowles, R.S. Chaganti, and R. Dalla-Favera. 1994. Rearrangements of the BCL6 gene in diffuse large cell non-Hodgkin’s lymphoma. Blood 83:1757–1759. Lobachev, K.S., D.A. Gordenin, and M.A. Resnick. 2002. The Mre11 complex is required for repair of hairpin-capped double-strand breaks and prevention of chromosome rearrangements. Cell 108:183–193. Macheret, M., and T.D. Halazonetis. 2015. DNA replication stress as a hallmark of cancer. Annu Rev Pathol 10:425–448. Maki, C.G. 1999. Oligomerization is required for p53 to be efficiently ubiquitinated by MDM2. The Journal of biological chemistry 274:16531–16535. Maser, R.S., O.K. Mirzoeva, J. Wells, H. Olivares, B.R. Williams, R.A. Zinkel, P.J. Farnham, and J.H. Petrini. 2001. Mre11 complex and DNA replication: linkage to E2F and sites of DNA synthesis. Molecular and cellular biology 21:6006–6016. Mirzoeva, O.K., and J.H. Petrini. 2003. DNA replication-dependent nuclear dynamics of the Mre11 complex. Mol Cancer Res 1:207–218. Monti, P., P. Campomenosi, Y. Ciribilli, R. Iannone, A. Inga, A. Abbondandolo, M.A. Resnick, and G. Fronza. 2002. Tumour p53 mutations exhibit promoter selective dominance over wild type p53. Oncogene 21:1641–1648. Mullighan, C.G., C.B. Miller, I. Radtke, L.A. Phillips, J. Dalton, J. Ma, D. White, T.P. Hughes, M.M. Le Beau, C.H. Pui, M.V. Relling, S.A. Shurtleff, and J.R. Downing. 2008. BCR-ABL1 lymphoblastic leukaemia is characterized by the deletion of Ikaros. Nature 453:110–114. Pronier, E., R.L. Bowman, J. Ahn, J. Glass, C. Kandoth, T.R. Merlinsky, J.T. Whitfield, B.H. Durham, A. Gruet, A.V. Hanasoge Somasundara, R. Rampal, A. Melnick, R.P. Koche, B.S. Taylor, and R.L. Levine. 2018. Genetic and epigenetic evolution as a contributor to WT1-mutant leukemogenesis. Blood 132:1265–1278. Rajagopalan, S., A. Andreeva, T.J. Rutherford, and A.R. Fersht. 2010. Mapping the physical and functional interactions between the tumor suppressors p53 and BRCA2. Proceedings of the National Academy of Sciences of the United States of America 107:8587–8592. Rausch, T., T. Zichner, A. Schlattl, A.M. Stutz, V. Benes, and J.O. Korbel. 2012. DELLY: structural variant discovery by integrated paired-end and split-read analysis. Bioinformatics 28:i333–i339. Reina-San-Martin, B., M.C. Nussenzweig, A. Nussenzweig, and S. Difilippantonio. 2005. Genomic instability, endoreduplication, and diminished Ig class-switch recombination in B cells lacking Nbs1. Proceedings of the National Academy of Sciences of the United States of America 102:1590–1595. Roset, R., A. Inagaki, M. Hohl, F. Brenet, J. Lafrance-Vanasse, J. Lange, J.M. Scandura, J.A. Tainer, S. Keeney, and J.H. Petrini. 2014. The Rad50 hook domain regulates DNA damage signaling and tumorigenesis. Genes & development 28:451–462. Sarmento, L.M., V. Povoa, R. Nascimento, G. Real, I. Antunes, L.R. Martins, C. Moita, P.M. Alves, M. Abecasis, L.F. Moita, R.M. Parkhouse, J.P. Meijerink, and J.T. Barata. 2015. CHK1 overexpression in T-cell acute lymphoblastic leukemia is essential for proliferation and survival by preventing excessive replication stress. Oncogene 34:2978–2990. Schiller, C.B., K. Lammens, I. Guerini, B. Coordes, H. Feldmann, F. Schlauderer, C. Mockel, A. Schele, K. Strasser, S.P. Jackson, and K.P. Hopfner. 2012. Structure of Mre11-Nbs1 complex yields insights into ataxia-telangiectasia-like disease mutations and DNA damage signaling. Nature structural & molecular biology 19:693–700. Schoppy, D.W., R.L. Ragland, O. Gilad, N. Shastri, A.A. Peters, M. Murga, O. Fernandez-Capetillo, J.A. Diehl, and E.J. Brown. 2012. Oncogenic stress sensitizes murine cancers to hypomorphic suppression of ATR. The Journal of clinical investigation 122:241–252. Sirbu, B.M., W.H. McDonald, H. Dungrawala, A. Badu-Nkansah, G.M. Kavanaugh, Y. Chen, D.L. Tabb, and D. Cortez. 2013. Identification of proteins at active, stalled, and collapsed replication forks using isolation of proteins on nascent DNA (iPOND) coupled with mass spectrometry. J Biol Chem 288:31458–31467. Stadtfeld, M., and T. Graf. 2005. Assessing the role of hematopoietic plasticity for endothelial and hepatocyte development by non-invasive lineage tracing. Development 132:203–213. Stewart, G.S., R.S. Maser, T. Stankovic, D.A. Bressan, M.I. Kaplan, N.G. Jaspers, A. Raams, P.J. Byrd, J.H. Petrini, and A.M. Taylor. 1999. The DNA double-strand break repair gene hMRE11 is mutated in individuals with an ataxia-telangiectasia-like disorder. Cell 99:577–587. Stracker, T.H., and J.H. Petrini. 2011. The MRE11 complex: starting from the ends. Nature reviews. Molecular cell biology 12:90–103. Syed, A., and J.A. Tainer. 2018. The MRE11-RAD50-NBS1 Complex Conducts the Orchestration of Damage Signaling and Outcomes to Stress in DNA Replication and Repair. Annu Rev Biochem 87:263–294. Teng, G., and D.G. Schatz. 2015. Regulation and Evolution of the RAG Recombinase. Adv Immunol 128:1–39. Theunissen, J.W., M.I. Kaplan, P.A. Hunt, B.R. Williams, D.O. Ferguson, F.W. Alt, and J.H. Petrini. 2003. Checkpoint failure and chromosomal instability without lymphomagenesis in Mre11(ATLD1/ATLD1) mice. Molecular cell 12:1511–1523. Venkatraman, E.S., and A.B. Olshen. 2007. A faster circular binary segmentation algorithm for the analysis of array CGH data. Bioinformatics 23:657–663. Weng, A.P., A.A. Ferrando, W. Lee, J.P.t. Morris, L.B. Silverman, C. Sanchez-Irizarry, S.C. Blacklow, A.T. Look, and J.C. Aster. 2004. Activating mutations of NOTCH1 in human T cell acute lymphoblastic leukemia. Science 306:269–271. Williams, B.R., O.K. Mirzoeva, W.F. Morgan, J. Lin, W. Dunnick, and J.H. Petrini. 2002. A murine model of Nijmegen breakage syndrome. Current biology: CB 12:648–653. Ye, B.H., F. Lista, F. Lo Coco, D.M. Knowles, K. Offit, R.S. Chaganti, and R. Dalla- Favera. 1993. Alterations of a zinc finger-encoding gene, BCL-6, in diffuse large-cell lymphoma. Science 262:747–750. Zeman, M.K., and K.A. Cimprich. 2014. Causes and consequences of replication stress. Nat Cell Biol 16:2–9. Zha, S., C.H. Bassing, T. Sanda, J.W. Brush, H. Patel, P.H. Goff, M.M. Murphy, S. Tepsuporn, R.A. Gatti, A.T. Look, and F.W. Alt. 2010. ATM-deficient thymic lymphoma is associated with aberrant tcrd rearrangement and gene amplification. The Journal of experimental medicine 207:1369–1380.